"Acquire the Spirit of Peace and a Thousand Souls Around You Shall Be Saved"
Our father among the saints Seraphim of Sarov was a Russian ascetic who lived at the Sarov Monastery in the 18th century, and is considered a wonder-worker. 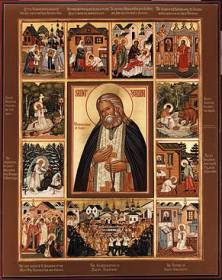 The Church commemorates St. Seraphim on January 2, and the opening of his relics on July 19. 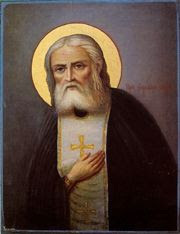 St. Seraphim of Sarov is one of the most beloved Orthodox saints of recent times (1759–1833). He is credited with acquiring in a most full way, the grace and the Spirit of God. He spent 1,000 days and nights on a rock praying to God for forgiveness. He was a hermit, spiritual guide and priest. He led many christian souls along the path in of apostolic Christianity in Russia during the 19th-century. Born on July 19, 1754, at Kursk, Russia. His parents, Isidore and Agathia Moshnin, lived in Kursk, Russia; Isidore was a merchant. At the age of 10, Seraphim became seriously ill. During the course of his illness, he saw the Mother of God in his sleep, who promised to heal him. Several days later there was a religious procession in Kursk with the locally revered miracle-working icon of the Mother of God. Due to bad weather, the procession took an abbreviated route past the house of the Moshnin family. After his mother put Seraphim up to the miracle-working image, he recovered rapidly. While at a young age, he needed to help his parents with their shop, but business had little appeal for him. Young Seraphim loved to read the lives of the saints, to attend church, and to withdraw into seclusion for prayer. He started as meek and labor-loving monk but later on as a ascetic recluse and finally a spiritual guide to thousands of souls in Russia, St. Seraphim remains one of the most beloved saints in his own land , and is known universally as a miracle-worker and a glorious bearer of God's grace. Orthodox spirituality has produced many holy and famous men, but none in recent centuries to compare with Seraphim of Sarov. He started as a monk working with people and then he was led to become a hermit. He lived deep in the forest and was all alone with only his pet bear, Misha, to keep him company. But, his solitude was interrupted when he was attacked by bandits. So he returned to the community and in 1825, after fifteen years in silence, he began to receive visitors again and to spend his energies in their spiritual direction. By means of his faith and asceticism he performed a number of miracles. His fame and humility brought a steady stream of visitors, religious and royalty alike, to him for advice. Tsar Nicholas wanted to appoint Seraphim as the Metropolitan of St. Petersburg. This was not to the austere monk's taste. He remained a private meditative counselor until his death. The church proclaimed him a saint in 1903. His humility and concern for people made Sarov a center of pilgrimage until the events of the 1917 revolution. For 45 years he led the life of a contemplative, first in the monastery and then in an isolated hut. Eight years before his death he opened his cell to visitors so that they might seek his advice. It was said he could supply answers before visitors had time to ask their questions. He counseled tough cases of conscience and reportedly worked miracles, healing the sick. Gentle but firm with others, he was very severe with himself. He spent many nights in continual prayer. Depth in spiritual prayer was open, he said, to all Christians. Through his teaching and his life, he revived monasticism as a helpful force to common believers in the Russian Orthodox church. For St. Seraphim emphasized that the whole purpose of life was to be filled with the Holy Spirit. Doing good in Christ's name was but a means to this end. He saw contemplation, self-denial and meditation as means of bringing oneself to ecstatic prayer. Once while discussing the topic with his disciple Motovilov, he became so shining that Motovilov could not at first look at him. His eyes were flashing like lightning, and his face shone like the sun. When finally able to lift his eyes to gaze upon his master, Motovilov was filled with peace and joy. This peace and joy, said Seraphim, was the peace and joy Christ promised the disciples at the last supper when he said, "My peace I give unto you," and "your sorrow will be turned to joy." St. Seraphim was loved by all, but he was especially loved by children and heal so loved them a lot. When adults came to St. Seraph while he was living in his hermitage, there were times when he did not respond, so they sent their children out to call him, and he then would appear, spreading sunshine in all their hearts. 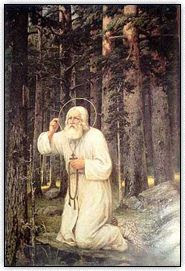 St. Seraphim was , healed as a boy by the wonder-working Kursk Root Icon of the Mother of God, and he entered the monastery of Sarov when he was nineteen years of age. His mother blessed him with a large copper crucifix, which he wore over his clothing all his life. After this, he entered the Sarov monastery as a novice. From day one in the monastery, exceptional abstinence from food and slumber were the distinguishing features of his life. He ate once a day, and little. On Wednesdays and Fridays he ate nothing. He spent many years in monastic service, bearing all manner and types physical brutality with unfailing love, patience, and humility. As his fame as a prophet and spiritual light spread throughout Russia, thousands of pilgrims flocked to his wilderness retreat to receive healing's and spiritual consulting. In obedience to his superiors, he became the spiritual father for nearby nuns and inspired and instructed many. Since he departed this life in l833, his sound has gone forth into all the earth, so much so that many consider him to be the greatest force behind the revival of Orthodox mysticism in the l9th century Russia and indeed throughout the world today. 80 verified instances of miraculous healing worked by Seraphim. Sarov is a town in the southern Russia in the Nizhny Novgorod region. By the middle of the 18th century the Sarov hermitage had become a well-known spiritual center. The history of Sarov is connected with the pride of the Sarov and Diveyevo monasteries. This place became known due to good deeds and spiritual achievements of the monk Seraphim, it is the last place of St Seraphim lived. In 1903, Sarvo was visited by Emperor of All Russia Nicholas II who with his family and court attended the ceremony of canonization of St Seraphim of Sarov. The uncovering of the holy relics of Saint Seraphim of Sarov on July 19, 1903 was attended by many thousands, among them the foremost of the clergy and Christians. After 1917 the hermitage was destroyed. The Church of St. Seraphim of Sarov is being successfully restored in the town of Sarov (the Nizhny Novgorod region). The town opened a monument to St Seraphim, one of the most revered saints in Russia, the 100th anniversary. Maintain a spirit of peace and you will save a thousand souls. God is a fire that warms and kindles the heart and inward parts. Hence, if we feel in our hearts the cold which comes from the devil—for the devil is cold—let us call on the Lord. He will come to warm our hearts with perfect love, not only for Him but also for our neighbor, and the cold of him who hates the good will flee before the heat of His countenance. The body is a slave, the soul a sovereign, and therefore it is due to Divine mercy when the body is worn out by illness: for thereby the passions are weakened, and a man comes to himself; indeed, bodily illness itself is sometimes caused by the passions. Without sorrows there is no salvation. On the other hand, the Kingdom of God awaits those who have patiently endured. And all the glory of the world is nothing in comparison. Those who have truly decided to serve the Lord God should practice the remembrance of God and uninterrupted prayer to Jesus Christ, mentally saying: Lord Jesus Christ, Son of God, have mercy on me, a sinner. When despondency seizes us, let us not give in to it. Rather, fortified and protected by the light of faith, let us with great courage say to the spirit of evil: "What are you to us, you who are cut off from God, a fugitive for Heaven, and a slave of evil? You dare not do anything to us: Christ, the Son of God, has dominion over us and over all. Leave us, you thing of bane. We are made steadfast by the uprightness of His Cross. Serpent, we trample on your head." "It is necessary that the Holy Spirit enter our heart. Everything good that we do, that we do for Christ, is given to us by the Holy Spirit, but prayer most of all, which is always available to us,"
"Prayer, fasting, vigil and all other Christian practices, however good they may be in themselves, do not constitute the aim of our Christian life, although they serve as the indispensable means of reaching this end. The true aim of our Christian life consists in the [increasing] acquisition of the Holy Spirit of God. As for fasts, and vigils, and prayer, and almsgiving, and every good deed done for Christ's sake, they are only means of acquiring the Holy Spirit of God." "…the people who, in spite of the bonds of sin which fetter them and hinder them (by constraint and by inciting them to new sins), come to Him, our Savior, with perfect repentance for tormenting Him, who despise all the strength of the fetters of sin and force themselves to break their bonds – such people at last actually appear before the face of God made whiter than snow by His grace. 'Come, says the Lord: Though your sins be as scarlet, I will make them whiter than snow' (Isa. 1:18)." "Every success in anything we should refer to the Lord and with the Prophet say: 'Not to us, O Lord, not to us, but to Your name give glory' (Ps. 113:9)." "The true aim of our Christian life consists in the acquisition of the Holy Spirit of God… But… only the good deeds done for Christ’s sake bring us the fruits of the Holy Spirit." "…only the good deed done for Christ’s sake brings us the fruits of the Holy Spirit. All that is not done for Christ’s sake, even though it be good, brings neither reward in the future life nor the grace of God in this life. That is why our Lord Jesus Christ said: 'He who gathers not with Me scatters' (Lk. 11:23)."